Planning a career in chemistry is just like planning any other career: you need a plan, you need to develop and describe your skills, and you need to develop tools and techniques to find and land the position you want. UVic Career Services offers a great range of on-line and in-person services to help you get started. Grad students will find the MyIDP webtool run by the AAAS to offer great advice on science careers. In addition, Jeremy Pearce - Career Educator for Sciences, is available for drop-in in Elliot Building room 306 from 10:00 a.m. to 12:00 noon on Wednesdays, or at jeremydp@uvic.ca. We’re here to assist you with chemistry-specific information and support. 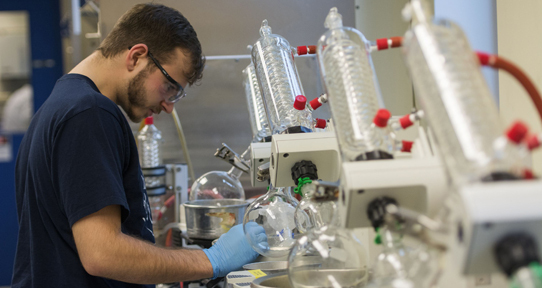 Chemistry Co-op is a great way to get employment experience in a variety of chemistry jobs. So are our research opportunities which provide a chance to experience new chemistry and to expand your network. One of the keys to your career in the coming years is your network. That will include us—staff and faculty—and your fellow students. Even before you graduate, our alumni could also be helpful as you build your network. Volunteering as a Judge at the Vancouver Regional Science Fair. Volunteering as a Scientist to do school visits with the Scientists and Innovators in the Schools Program. UVic Chemistry graduates meet the educational requirements to be registered as a Professional Chemist in BC. Before you graduate, student membership in the Association of the Chemical Profession of BC opens access to the ACPBC mentoring program that puts student members in contact with current chemists in a variety of industries in BC. The ACPBC, together with other provincial organizations and the national association Canada's Professional Chemists/ Chimistes professionnels du Canada, is actively engaged in promoting the chemical profession and the career development of chemists in Canada.